Chocolate Thunder, (not Darryl Dawkins), is one of those comic book heroes that I never really got to know but wanted to. I ran into references to the comic many times a few years back but never actually got a copy of the book in my hands. The official website Gettosake.com has no direct reference to this comic at all. In fact, at the time I am writing this, the entire site is down. One of the original writers of this book, Jeremy Love, has done some amazing work with Bayou but no word of Chocolate Thunder. Why am I so hyped up about the guy? Well I’m always looking into new and interesting Black Superheroes but my interest piqued when I saw the video. Apparently the guys who put this character together made a flash video a few years back to promote the comic and I loved it. It even inspired me to do some of my own flash work. It was only available on the Gettosake website but with that gone, who knows. I was lucky to find it on YouTube. It’s called Chocolate Thunder: On My Way. 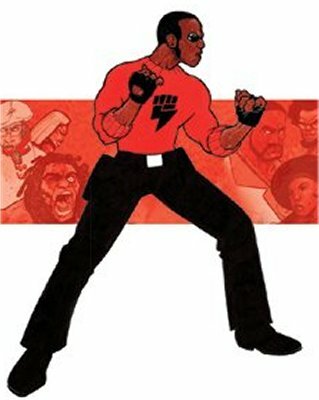 Wikipedia doesn’t even have an entry on this brother but he did make their List of Black Superheroes. The best listing I was able to find, other than the official page, is a reference to him here. I looked to buy the comic on Amazon but they are either out of print or there are no books in stock for the foreseeable future. I’m positive Chocolate Thunder made it to print but I wonder if I will ever see it. Regardless, the character will not be forgotten.